The top event of European women’s handball gets a top band to perform at it. With 108 days to go until the WOMEN’S EHF FINAL4 2018 throws off in the Papp László Budapest Sportaréna on 12 May, organisers have confirmed that British group Clean Bandit will take centre stage ahead of the final on 13 May. Clean Bandit, that is Grace Chatto and the two brothers, Jack and Luke Patterson, whose unique ability to mix electronic dance with classical music has brought them success all over the world. Their biggest hit to date, ‘Rockabye’ featuring Sean Paul and Anne-Marie, has been viewed 1.7 billion times on Youtube and became their second no.1 hit in the UK in 2016. In 2015, their song ‘Rather Be’ won a Grammy Award for Best Dance Recording. 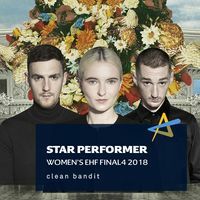 Clean Bandit will prepare a whopping show for the WOMEN’S EHF FINAL4 and will take centre stage during the opening show ahead of the final. They will appear once more after the final, offering fans to celebrate with them the very best of women’s handball in truly unique fashion. It is the fifth consecutive time that the WOMEN’S EHF FINAL4 comes to Budapest and the Papp László Sportaréna. Tickets for the event on 12/13 May 2018 can be bought at www.ehfFINAL4.com.